Wissahickon is a neighborhood in the section of Lower Northwest Philadelphia in the state of Pennsylvania. Wissahickon is located adjacent to the neighborhoods of Roxborough and Manayunk, and it is bounded by the Wissahickon Valley Park, Ridge Avenue, Hermit Street, and Henry Avenue. The name of the neighborhood comes from the Lenni Lenape word wisameckham, for "catfish creek", a reference to the fish that were once plentiful in the Wissahickon Creek. The village of Wissahickon was founded by officials of the Pencoyd Iron Works in the late nineteenth century. The 100 Steps: Located at the base of Freeland Avenue, these broad stairs were built in 1901 of Wissahickon granite and local ironwork. Restoration work was completed between 2003-05 as steps were repaired, new lighting was installed, and railings were replaced. The 100 Steps offer a convenient route to the trails in Wissahickon Valley Park. LaNoce Park: Bounded by Osborn Street, Rochelle Avenue, and Kalos Street, this park is the site of the former Wissahickon School and was established in 1984 by way of transfer to the Fairmount Park Commission. It was named for former owner of the Wissahickon Barber Shop and community leader Sabatina LaNoce who died in 1980. Merrick Hall: Located on the 5300 block of Ridge Avenue, this is the oldest building on Northern Children’s Services campus. Designed by noted Philadelphia architect Lindley Johnson in the 1870s, it was originally the former home of 19th century industrialist J. Vaughan Merrick. The house was renovated in 1927 by the well-known Philadelphia architect Horace Trumbauer and more recently in 2012-14 by Philadelphia architecture firm Jacobs Wyper Architects. Northern Children's Services: Located on the 5300 block of Ridge Avenue, this is a cluster of stone buildings, including four dormitories, an infirmary, a dining hall and kitchen, a gymnasium, a library and meeting rooms, designed and altered by Philadelphia architect Horace Trumbauer in 1927 on a six-acre campus aimed at helping children and their families do better. The Ridge Avenue Bridge: Located at the southern edge of the neighborhood, it is a triple-span stone arch bridge built in 1888 and added to the National Register of Historic Places in 1988. The bridge carries Ridge Avenue over the Wissahickon Creek and into East Falls. St. Timothy's Workingmen's Club and Institute: Located at the intersection of Ridge Avenue, Terrace Street, and Vassar Street, and founded in 1872 with funds donated by the Merrick family and St. Timothy's Episcopal Church. Constructed of Wissahickon schist with granite trim, the building was designed by architect Charles M. Burns Jr. and completed in 1877. Mr. J. Vaughan Merrick delivered an address at the opening of the new building. The club provided social and educational opportunities for working men: there was a library plus reading and billiard rooms, baseball and cricket teams, in addition to free night classes in mechanical drawing, engineering, and chemistry. The club ceased operations in 1912 due to declining membership brought on by the increase of local public libraries and public schools as well as the invention of the motion picture as entertainment. The building was added to the Philadelphia Register of Historic Places in 1974. William Paine House: Located at the intersection of Vicaris Street and Osborn Street, the house was built circa 1869 in the Georgian style and added to the Philadelphia Register of Historic Places in 1993. William Paine, M.D., (1821-1893), practitioner of eclectic medicine, was a faculty member, general manager, and dean of the American College of Medicine in Philadelphia (also known as the Philadelphia University of Medicine and Surgery) until he was caught up in controversies surrounding trade in bogus diplomas. Wissahickon Presbyterian Church: Located at the intersection of Ridge Avenue, Dawson Street, and Manayunk Avenue, the church was built in 1893 and started with 54 members. The building is Gothic and Renaissance style combined, built with Avondale stone with limestone trimmings. Taking into consideration the four Census Block Groups that mostly comprise the area (BG0209001, BG0209002, BG0209003, and BG0211001), as of the 2010 Census, the Wissahickon neighborhood had roughly 3,163 residents, 1,520 households, and 659 families. The racial makeup of Wissahickon was roughly 87.48% White/Caucasian, 6.32% Black or African-American, 2.84% Asian, 2.75% two or more races, .41% some other race, and .18% were American Indian/Alaska Native. Native or Latino people of any race were roughly 2.87% of the population. Of the roughly 1,520 households, 15% had children under the age of 18 living with them. Roughly 44.10% of the residents were between 18 and 34 years old, 33.10% between 35 and 64 years old, 12.64% are under 18 years old, and 10.14% are over 65 years old. The School District of Philadelphia operates public schools. Cook-Wissahickon School is a K-8 grade school located in the area. The school was built in 1968 at the corner of East Salaignac and Righter Streets to replace the aging Cook Public School and the Wissahickon School. The former Wissahickon School, built in 1887, was located at the north east corner of (then) Ridge Avenue and Kalos Street, now the site of LaNoche Park. Residents zoned to Cook-Wissahickon are zoned to Roxborough High School. Free Library of Philadelphia operates its Roxborough Branch, serving Wissahickon, at 6245 Ridge Avenue at Hermitage Street. A prior library, the Wissahickon Branch, located at Manayunk Avenue and Osborn Street, opened in 1909 and was built on land donated by the Pencoyd Iron Works. It was the ninth Andrew Carnegie-funded Free Library branch designed by the architectural firm of Whitfield and King and featured a main reading room, a children's room which also served as a lecture room seating 100, and a basement consisting of a boiler room, coal bin, staff room, a small magazine room, and two toilets. The Wissahickon Branch served the Wissahickon neighborhood until it closed in 1969. Sometime soon after, the building burned down. One SEPTA Regional Rail line connects the neighborhood to Center City: the Manayunk/Norristown Line stops at the Wissahickon station. The station was once home to a building designed by the renowned architect Frank Furness; however, the building was later demolished. Improvements were made to the existing station, and during Summer 2016, local artist and Moore College of Art & Design faculty member, David Guinn painted a mural on a retaining wall running along the outbound platform of the station, coordinated by the Wissahickon Interested Citizen's Association, Mural Arts Program, and Cook-Wissahickon School. The neighborhood is also served by bus routes 9, 27, and 65. The Wissahickon Transfer Station offers connecting service to routes 1, 9, 27, 35, 38, 61, 62, 65, 124, 125, & R.
The local civic association is called Wissahickon Interested Citizen's Association (WICA). Public meetings are held on the second Wednesday of every month at Northern Children's Services. Another area civic association, Wissahickon Neighbors Civic Association (WNCA), serves the community northwest of Ridge Avenue. Public meetings are held on the first Monday of every month at Pilgrim Church. ^ Campbell, William Bucke (1942). "Old Towns and Districts of Philadelphia: An Address Delivered Before the City History Society of Philadelphia, February 26, 1941". Philadelphia History. 4 (5) – via Penn State University Libraries Digital Collections. ^ Salisbury, Stephan (May 5, 2005). "100 Steps Zigzag in Right Direction". The Philadelphia Inquirer. pp. B.1. Retrieved 21 February 2016. ^ Allegretti, Jeffrey (January 20, 2015). "Nomination of Historic Building, Structure, Site, or Object (145 Sumac Street)" (PDF). City of Philadelphia, Historical Commission. Retrieved June 3, 2018. ^ Jaffe, Alan (Jun 2, 2015). "Multi-pronged Battle Ahead for Group of Neighbors Trying to Save Historic Wissahickon House". PlanPhilly. Retrieved June 3, 2018. ^ Jaffe, Alan (June 24, 2015). "Historic Recognition Won't Save Roxborough House from Demolition". PlanPhilly. Retrieved June 3, 2018. ^ Jaffe, Alan (August 17, 2015). "Civic Group, Developer Reach Agreement about Future of Historic Wissahickon Property". PlanPhilly. Retrieved June 3, 2018. ^ Lurye, Sharon (August 17, 2015). "Historic House in Manayunk Saved from Demolition". Philly Voice. Retrieved June 3, 2015. ^ Romero, Melissa (July 29, 2016). "Wissahickon Queen Anne Home Undergoes Restoration, asks $499K". Curbed Philadelphia. Retrieved June 3, 2018. ^ "FP.2010.001, Reference Collection (Finding Aid), Fairmount Park Historic Resource Archives". PACSCL Finding Aids. Retrieved 13 July 2016. ^ Chakars, Janis (23 April 2012). "Phil Moyer Keeps LaNoce Park Looking Good". Newsworks. Retrieved 13 July 2016. ^ "Wissahickon Barber Shop Celebrates 100 years". WHYY. Retrieved June 3, 2018. ^ Kellogg, Isabelle (September 3, 2014). "Jacobs Wyper Architects Restores Merrick Hall at Northern Home for Children in Roxborough". American Institute of Architects Philadelphia Chapter. Retrieved 21 February 2016. ^ Fox, Jessie (September 23, 2013). "Expanding Services By Merging Old And New At Roxborough's Northern Services". Hidden City Philadelphia. Retrieved 21 February 2016. ^ "Northern Home for Friendless Children". Philadelphia Architects and Buildings. 2016. Retrieved 21 February 2016. ^ Chastain, Sue (December 13, 1994). "A Roxborough Home For Boys Helps Them To Move Forward". The Philadelphia Inquirer. Retrieved 21 February 2016. ^ Scally, Bernard J. (August 3, 2014). "Northern Children's Services offer more with Merrick Hall reopening". Roxborough Review. Retrieved 21 February 2016. ^ a b c Manton, John Charles (1990). Bygones: A Guide to Historic Roxborough-Manayunk. Philadelphia: J.C. Manton. pp. 87–88. OCLC 21743508. ^ a b "St. Timothy Working Men's Club & Institute". Philadelphia Architects and Buildings. The Athenaeum of Philadelphia. 2018. Retrieved May 26, 2018. ^ Merrick, J. Vaughan (1878). Workingmen's Clubs and Institutes: How to Organize and How to Conduct Them : an Address at the Opening of the New Building Erected for St. Timothy's Workingmen's Club and Institute, Roxborough, Philadelphia. Philadelphia. OCLC 77318739. ^ Manton, John C. (1983). Victorian Roxborough: An Architectural History. J.C. Manton, Historical Research. pp. 22–25. OCLC 256225727. ^ a b mjk38 (2014-08-11). "End of St. Timothy's Workingmen's Club and Institute in Roxborough (1913)". Philadelphia Studies. Retrieved 2016-07-14. ^ "Paine Residence". Philadelphia Architects and Buildings. The Athenaeum of Philadelphia. 2018. Retrieved May 25, 2018. ^ Moak, Jefferson M. (December 13, 2011). 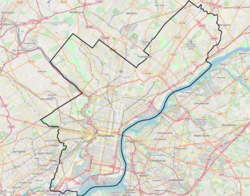 "City of Philadelphia, Records Department, City Archives, RG 149.6, Fairmount Park Commission Index to Briefs of Title of Fairmount Park Properties. (Finding Aid)". PACSCL Finding Aids. University of Pennsylvania Libraries. Retrieved May 25, 2018. ^ Haller, John S., Jr., (1994). Medical Protestants: The Eclectics in American Medicine, 1825-1939. Carbondale: Southern Illinois University Press. ISBN 0585029660. OCLC 42854393. ^ Paine, William (1870). Pennsylvania frauds! How state officials teach a political arithmetic! What Dr. Paine knows of the frauds of the Pennsylvania war claims. Internet Archive. ^ "Alumni Personals". The Lafayette Weekly. May 26, 1899. ^ "Wissahickon Presbyterian Church". Philadelphia Architects and Buildings. 2017. ^ White, William P. (1895). The Presbyterian Church in Philadelphia. A Camera and Pen Sketch of Each Presbyterian Church and Institution in the City. Philadelphia: Allen, Lane & Scott. p. 213. ^ a b c "2010 Census: Apportionment Data Map". United States Census Bureau. Retrieved May 27, 2018. ^ "Cook-Wissahickon Elementary School". The School District of Philadelphia. Retrieved 16 July 2015. ^ "Welcome". Cook-Wissahickon Elementary School. The School District of Philadelphia. Retrieved 21 February 2016. ^ Edmunds, Franklin Davenport (February 12, 1914). "Wissahickon School". Free Library of Philadelphia Digital Collections. Retrieved November 24, 2017. ^ "High School Directory Fall 2017 Admissions" (Archive). School District of Philadelphia. p. 57/70. Retrieved on November 16, 2016. ^ "Roxborough Branch." Free Library of Philadelphia. Retrieved on November 7, 2008. ^ Fourth Annual Message of John E. Reyburn Mayor of the City of Philadelphia with Annual Reports of Various Departments ..., Volume 1. Philadelphia, PA: Dunlap Printing Co. 1911. p. 1137. Retrieved 20 February 2016. ^ "Wissahickon Branch: Interior view of the Wissahickon Branch, ca. 1909". Free Library of Philadelphia Digital Collections. 2016. Retrieved 20 February 2016. ^ "Wissahickon Branch: Exterior view of the Wissahickon Branch, ca. 1909". Free Library of Philadelphia Digital Collections. 2016. Retrieved 20 February 2016. ^ Thomas, George E. (2012). "Frank Furness: Philadelphia & Reading Railroad". FrankFurness.org. Retrieved 20 February 2016. ^ Pasquarello, Daniel (January 2, 2015). "Proposed Wissahickon mural aims to show local balance between urban and natural environments". WHYY/NewsWorks. Retrieved 20 February 2016. ^ Muse, Queen (April 20, 2015). "Community begins to brainstorm for upcoming mural at the Wissahickon station". WHYY/NewsWorks. Retrieved 20 February 2016. ^ Corrigan, John (August 5, 2015). "Plans for Wissahickon Station mural revealed". WHYY/NewsWorks. Retrieved 20 February 2016. ^ "Mural Begins to Unfold in Wissahickon". Town News Today. June 14, 2016. Retrieved July 13, 2016. Bicknell, Joseph D. The Wissahickon in History, Song and Story. Philadelphia, PA: The City History Society of Philadelphia, 1908. Print. Del Collo Deborah. Roxborough. Charleston, SC: Arcadia Pub, 2011. Print. Herman, Andrew M. Along the Wissahickon Creek. Charleston, SC: Arcadia Pub, 2004. Print. Manton, John Charles: Bygones: A Guide to Historic Roxborough-Manayunk. Philadelphia : J. C. Manton, Historical Research, c1990. Miles, Joseph S., and William H. Cooper. A Historical Sketch of Roxborough, Manayunk, Wissahickon. Philadelphia, PA: G. Fein & Co., 1940. Print. Minardi, Joseph. Historic Architecture in Philadelphia: East Falls, Manayunk, and Roxborough. Atglen, PA: Schiffer Publishing Ltd., 2013. Print. Myers, Nick. Milestones in History, 1690-1990: Roxborough, Manayunk, Wissahickon, Andorra. Philadelphia, PA: Roxborough-Manayunk-Wissahickon Historical Society, 1990. Print. This page was last edited on 11 March 2019, at 07:13 (UTC).